Zabuyelite: Mineral information, data and localities. 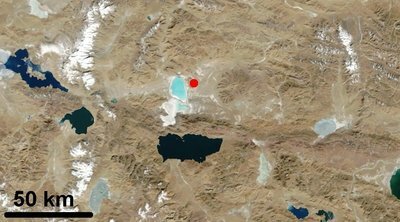 Named in 1987 by Mianping Zheng and Wengao Liu for the type locality, the Zhabuye Salt Lake, Nagri, Tibet, China. Originally found as very tiny microscopic colorless inclusions in microscopic fluid-bearing inclusions in spodumene. Spodumene 2 photos of Zabuyelite associated with Spodumene on mindat.org. 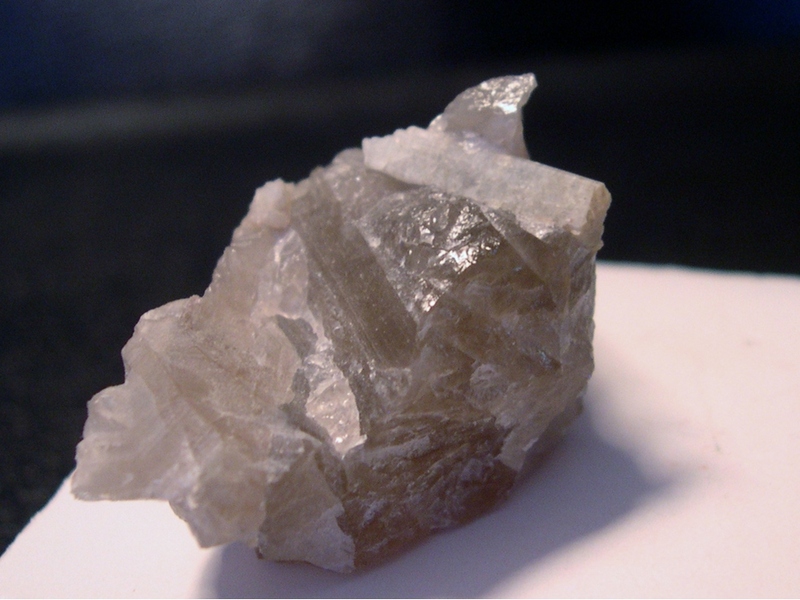 Quartz 2 photos of Zabuyelite associated with Quartz on mindat.org. Mallard, M.E. (1892): Sur la forme cristalline du carbonate de lithine. Bull. Soc. franç. Minéral. 15, 21-26. Zemann, J. (1957): Die Kristallstruktur von Li2CO3. Acta Crystallographica, 10, 664-666. Effenberger, H., Zemann, J. (1979): Verfeinerung der Kristallstruktur des Lithiumkarbonates, Li2CO3. Zeitschrift für Kristallographie 150, 133-138. Lin Yueling, Zhang Hanqing, and Zheng Mianping (1990): The crystal structure of zabuyelite. Kexue Tongbao, 35(6), 489–492 (in English). Idemoto, Y., Richardson, J.W., Koura, N., Kohara, S., Loong, C.K. (1998): Crystal structure of (LixK1-x)2CO3 (x = 0, 0.43, 0.5, 0.62, 1) by neutron powder diffraction analysis. Journal of Physics and Chemistry of Solids 59, 363-376. Anderson, A.J., Clark, A.H., Gray, S. (2001): The occurrence and origin of zabuyelite (Li2CO3) in spodumene-hosted fluid inclusions: implications for the internal evolution of rare-element granitic pegmatites. Canadian Mineralogist, 39, 1513-1527. LONDON, D., ZOLENSKY, M.E. & ROEDDER, E. (1987): Diomignite: natural Li2B4O7 from the Tanco pegmatite, Bernic Lake, Manitoba. Canadian Mineralogist 25, 173-180; Anderson, A J., Clark, A.H. & Gray, S. (2001). The occurrence and origin of zabuyelite (Li2CO3) in spodumene-hosted fluid inclusions: implications for the internal evolution of rare-element granitic pegmatites. Canadian Mineralogist 39, 1513-1527. Li, J., Chou, I., Yuan, S., & Burruss, R. C. (2009, December). Homogenization Temperature Measurements in Hydrothermal Diamond-Anvil Cell for Melt and Fluid Inclusions from the Jiajika Pegmatite Deposit, China. In AGU Fall Meeting Abstracts (Vol. 1, p. 2234). Lima, A.M.C., Martins, T.C., Vieira, R.C., Noronha, F. (2003): The study of fluid inclusions in petalite-bearing pegmatite-aplite veins of the Barroso-Alvão Field (Northern Portugal). Acta Mineralogica-Petrographica, Abstract Series 2, Szeged, 2003, 111-112. Anderson, A. J., Clark, A. H., & Gray, S. (2001). The occurrence and origin of zabuyelite (Li2CO3) in spodumene-hosted fluid inclusions: implications for the internal evolution of rare-element granitic pegmatites. The Canadian Mineralogist, 39(6), 1513-1527. Anderson, A J., Clark, A.H. & Gray, S. (2001). The occurrence and origin of zabuyelite (Li2CO3) in spodumene-hosted fluid inclusions: implications for the internal evolution of rare-element granitic pegmatites. Canadian Mineralogist 39, 1513-1527.